The Dubai World Cup isn’t just the biggest event of the party season, it’s quite literally the original social networking site. And what you wear depends on what it is you’re trying to achieve. The frock you turn up to this party in could pretty much change your fortunes, taking you from Apron Views to the Winner’s Circle. Thumb rule: Don’t overdress — even for Dubai, there’s such a thing as too much — and even if you do channel your inner 70s hippie child, do at least break out the iron first. So how do you fake it until you make it? Luckily we’re on hand to play fairy godfather — at least as far as wardrobe advice goes (the attitude is up to you) toss your head in anger. Subtlety always wins dressage points at the Dubai World Cup. Eliza Dolittle looked the party in My Fair Lady, but the movie was set at the turn of the last century. To achieve a similar effect, think Diane Lane in Secretariat, or Meghan Markle at Ascot. From Balmain and Kenzo to Max Mara and Tom Ford, beige was the rage on the spring catwalks, and luckily stores across the UAE are heaving with classic camel tones. Wear it as a trouser suit, or in lace — both are big trends this season — and you’re sure to exude old money. White and pastel tones work well on their own or even as florals and prints, but do remember that restraint is key to making this look work, particularly if you want to blag your way into the Nad Al Sheba Suite. Like a bit of structure in your life? This season is offering plenty of opportunities to impose order on the chaos everywhere — even at some of those after-parties! Structured looks are very much a thing, and this spring it’s time to show you mean business. Decide whether you’re the managerial type or a get-down-and-dirty kinda gal and take your pick from a bright, summery suit (Peter Pilotto, Roksanda, Mango, Gucci) or boiler-style onesie overalls (Hermès, Stella McCartney). 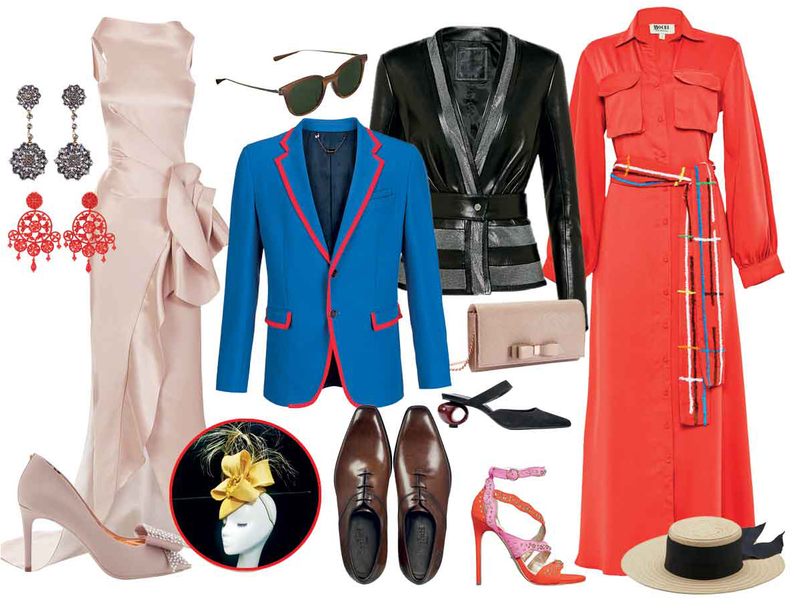 Or simply pick a sharply tailored number (Balenciaga, Philip Plein, Moschino). Bright colours or monochromes — neither would look out of place in Meydaan’s corporate suites, but can you handle the heat? From tie-dye and crochet to acid wash, retro street looks are a big deal this summer. Some designers referenced the California aesthetic, mixing in touches of athleisure and surfer gear, looks seen at Raf Simons for Calvin Klein, Proenza Shouler, Victoria Beckham and Marine Serre. Others sent out inspiration from whatever holiday they’d been on, so there was plenty of Asia and Africa at hand. The trend offers something for everyone at every price point, but for the World Cup you’re going to want to dress it up a little. Throw in a touch of romance with a ruffle or two. Denim isn’t usually something you want to wear to the races, but if you’ve been canny enough to get your grubby paws on something from Isabel Marant, Balenciaga or Celine, who are we to stop you? Be sure to carry a crafty bag or tote a straw hat — this year these are totes acceptable everywhere from Apron Views to the First Class Lounge. Sharp suits and moccasins are a race day classic for the gentlemen, so if it isn’t broken, why fix it? We’re loving Billionaire’s bordered jackets, but they might prove a little too Italian for you (if there’s such a thing! ), in which case we’d look to Virgil Abloh at Louis Vuitton and Kim Jones at Dior for their very elegant use of colour blocking (as well as Jones’ oblique jackets.) Lace and prints are other trends this season — we’d steer clear of the former and rock the track in the latter. If all else fails, play safe with a linen suit. Add a man bag, maybe a bit of bling and we guarantee the fillies will have a hard time keeping away. You’re allowed to go extra around the ears, not the hair. Statement earrings are huge, but for the Dubai World Cup, dial back the temptation to go all Ariana Grande, 7 Rings-style. Crystal blinders are good to go, but if you haven’t planned far enough to lock down your Alessandra Rich bling already, everyone from Oscar de la Renta to Mango have a decent selection of sparklies. It’s a trend men can rock too (see Adam Lambert at the Oscars). The other big accessory trend? It bags everywhere. If you’ve been a canny investor, this is one place you won’t need to spend a cent. Finally, you’ll need a headpiece. Crowns are out and jewelled clips are okay (except giant earrings) but it’s the races — leave your hat on. Even a straw boater with a twirl of ribbon is fine (It worked for Valentino). Hats were on catwalks everywhere, so don’t.